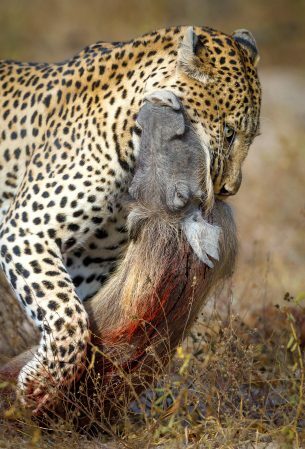 These poor warthogs failed to SPOT a cunning leopard sneaking up on them – with one of them ending up as its dinner. Dramatic video footage of the ambush shows the leopard leaping out from behind a mound of earth and seizing one of the fleeing warthogs. 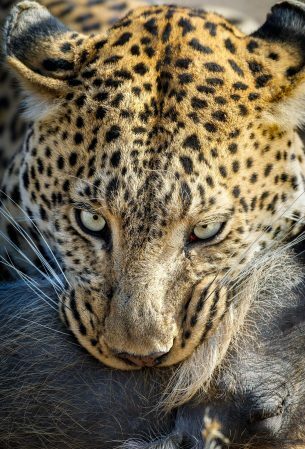 Just seconds before it struck the big cat was silently hiding right behind the entrance to the warthogs’ den, pricking up its ears and moving its head to get a clear line of sight. The leopard’s excellent camouflage in the savannah made it incredible difficult to spot among the brush. After deciding the coast was clear the four wild pigs climbed out of their burrow in an old termite mount, but were then caught completely by surprise. With squeals of fear they took off in all directions, kicking up clouds of dust, but a smaller warthog was unable to escape the leopard’s clutches. Grabbing his iPad to film, Chad managed to capture the dramatic scene from his Land Rover just three metres away. 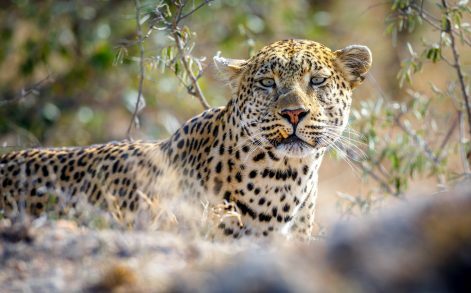 Chad, 35, from Hoedspruit in South Africa, said: “I was busy taking some of my guests out on safari, when we were notified of a male leopard that was found walking around the savannah late in the morning. “As my guests were big ‘Big Cat’ fans, I thought that they would love to go and see the leopard. 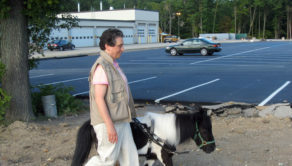 Little did we know that the sighting would turn out so spectacularly. “We had seen the same male leopard the morning before, and he was looking like he was in need of a meal. 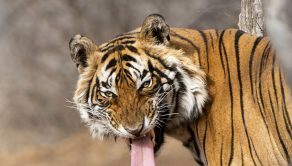 “Whilst following, we saw that he was heading straight for a termite mound, so I drove around to position in front of the mound so that we would have a view to see him when he climbed it to scout for a meal. 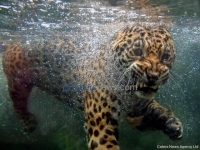 “However, upon arriving at the mound, the leopard went to investigate a burrow in the mound. 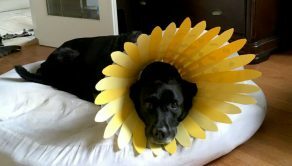 He poked his head into the hole, and immediately his disposition changed. “He went from being casual to alert in an instant, and carefully tiptoed backwards away from the mound, and went to hide behind the bush. “The leopard took up a position behind the bush and within a minute, we saw dust coming out of the mound, and I knew that things were about to kick off. 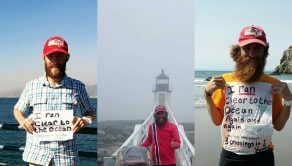 “It was at this point that I decided to pic up my iPad and film, just in case something happened. “I hadn’t been filming for a minute when a warthog’s head appeared from the burrow. 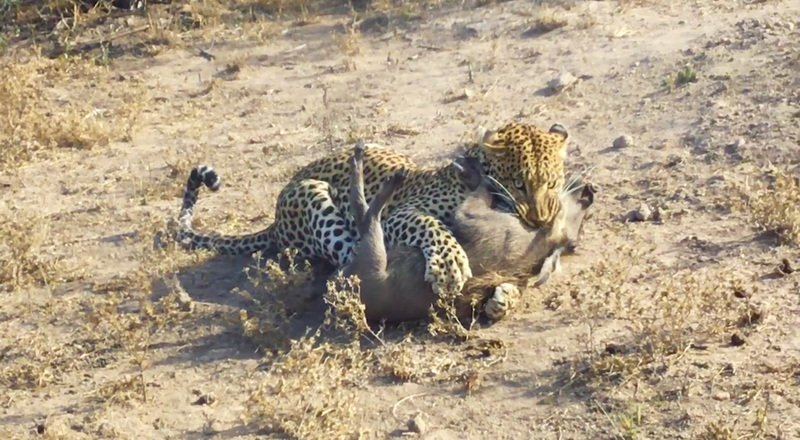 “It was the mother and the leopard went into a crouching position, analysing the situation. Female warthogs are not an easy meal, and their tusks can be used to good effect as defensive weapons. 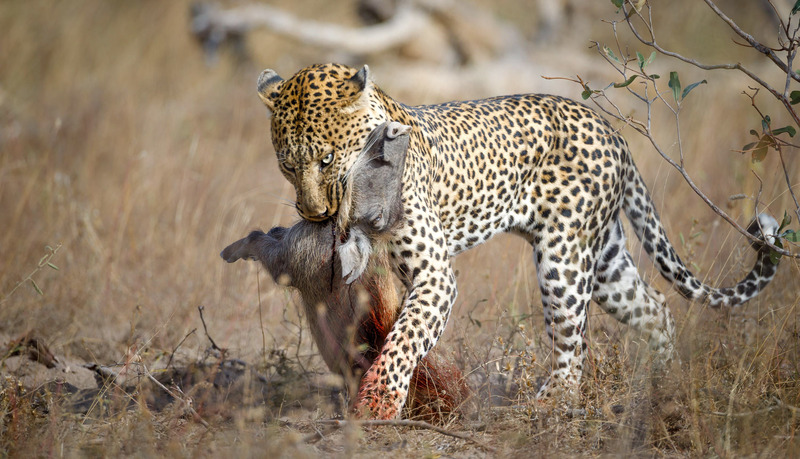 “However, when the first young warthog followed the mother out, the leopard and I knew that a much easier target was now on offer, and as soon as it emerged, the leopard sprung into action. “His initial movement was to go for the second piglet that ran from the burrow, but in the middle of the attack, he changed his mind and went for the third and final warthog that emerged from the burrow. 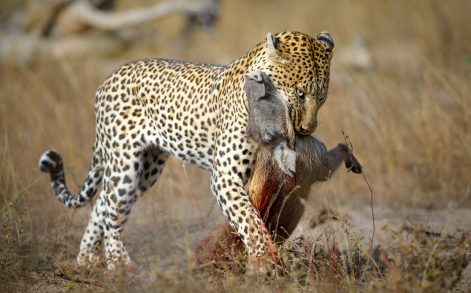 According to Chad his guests were delighted to see a leopard make a kill up close, having initially been pleased just to find one. Although some people have expressed sadness in reaction to the result of the leopard’s hunt, many people have told Chad they are amazed by the footage. “This is the first time I have been able to capture a kill on film. I normally take still photos, but when I realised what was about to unfold, I opted for my iPad and the video mode instead, and in hindsight I am glad I did, as still photos would never have done that scene justice.